Wow – it’s happening, folks! Even though I’d heard about this at my local store last week, I’m still a bit surprised that this is really a thing! 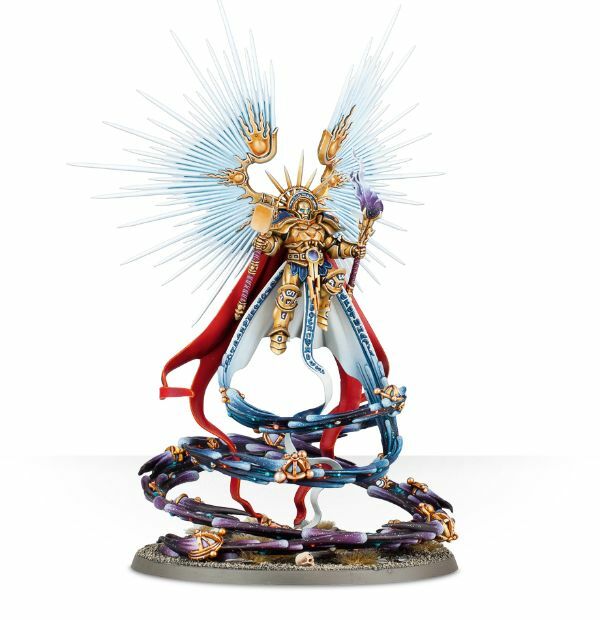 The Celestant-Prime is coming out next weekend, and it looks hilarious. 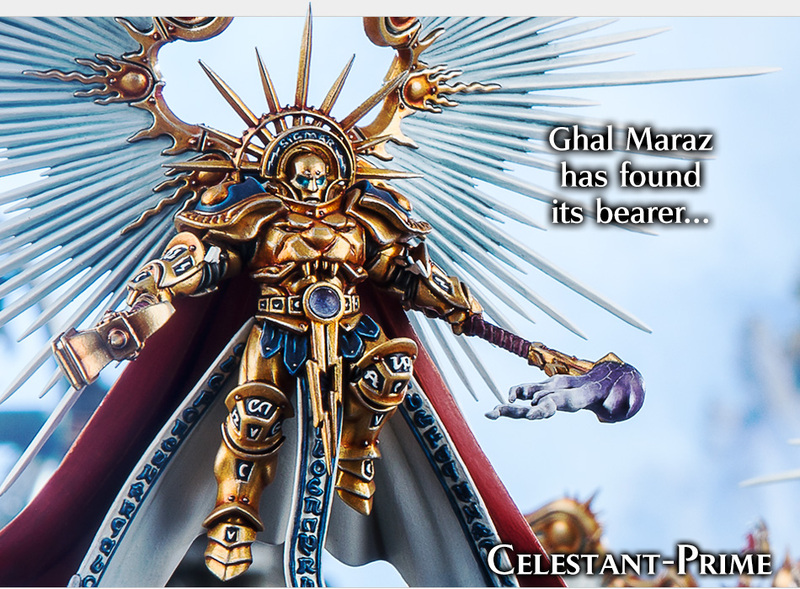 A massive Lord-Celestant with enormous wings, and of course – Ghal Maraz! The Lord-Celestant part of the model looks just fantastic – the armour looks superb, with all those details like the comet on the shoulder pads, the lightning-bolt buckle, it all just looks amazing. The wings are a little too goofy for my liking, I think the attempt to make them more imposing than a Prosecutor but not having them out wide has left it looking a little, well, weird. 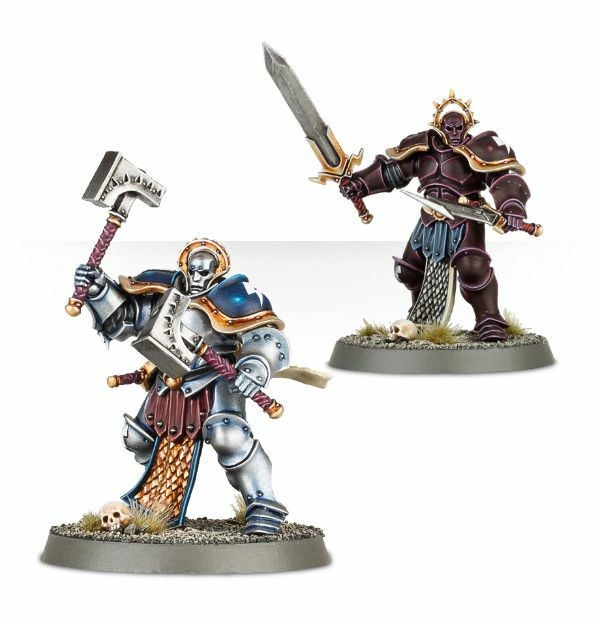 It’s really fun to see Ghal Maraz finally in a Warhammer figure – I mean, it really is the iconic weapon of Games Workshop. I mean, it’s a subjective thing, but the hammer in the Valten kit just doesn’t look as badass as this chap. The cometstrike sceptre is another awesome-looking weapon, which has a pretty amazing mechanic – allowing you to pull a comet from the heavens and hurl it onto the battlefield. All that swirling stuff at his feet is perhaps what seems most, well, goofy to me. All that gunk actually provides the model with the ability to change one roll to the result of your choice. Jeez! There’s no Paint Splatter in this week’s White Dwarf, though we do get a short piece on how to paint this mystical swirling energy. I’ve been enjoying these little bits of lore they feature in the magazine, it’s really nice to see that narrative sort of thing being pushed in line with the narrative focus of the game. This week I’ve been mainly finishing off the Judicator models I started the previous weekend. I’m really quite pleased with how these guys have come out, I must say! 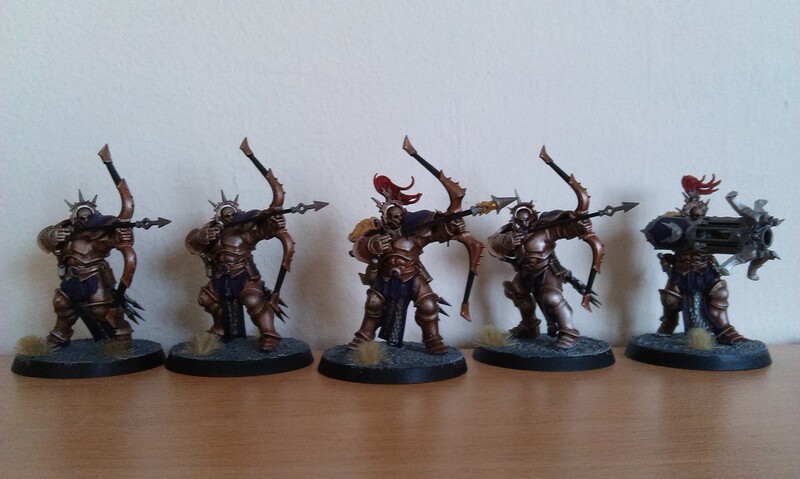 Very much worthy additions to my Lions of Sigmar, at any rate! I’ve been wanting to use my second box to get some more done with the crossbows, but instead I’ve started to work on yet more Liberators! I’ve built these guys up with the warblades, as I’d wanted to get these done since getting the box. They look pretty badass, and that chap with the grandblade looks particularly nice. As we have a long weekend, I’m thinking I might build up a couple more – those guys with paired warhammers could also be fun. We’ll see what happens. I also finished reading The Rise of the Horned Rat this week, the fourth novel in the End Times series. At first, I didn’t really like this – Skaven just annoy me. But as the novel wore on – actually, within just a couple of chapters – I really came to like it. The novel features the battle between the Skaven, the Goblins and the Dwarves at Karak Eight Peaks, and it was a whole lot of fun. Something I particularly liked was the way each race feels different through not just the manner of speech and such, but the very narrative itself. So the Dwarves are very stoic and so on, the Skaven are pretty chaotic, and the Goblins are just mad. It created a nice effect! I’ve found Goblins hilarious for a long time, and it was a lot of fun to read those parts of the novel that featured Skarsnik, the Goblin King. As with the established tradition here, the author, Guy Healey, is also the man responsible for a previous novel featuring a protagonist, having already penned the Warhammer Legends novel Skarsnik, along with novellas set in the same region. Anyway, it was a good read – perhaps not quite on a par with Fall of Altdorf, but still well worth reading. From what I can tell, the actual story of the End Times is now resumed: following the Return of Nagash, we have the Fall of Altdorf while, simultaneously, the Curse of Khaine and Rise of the Horned Rat take place in other parts of the Old World, so are almost branching-off from the timeline. But we’re back on track with the fifth and final novel, The Lord of the End Times! I’ve since started reading the climactic book, but haven’t really gotten very far. Hopefully next weekend will get there! Next Next post: Tournament Time!